Don’t let the Byzantine plot of Haruki Murakami’s 1Q84 deceive you. Haruki Murakami’s 1Q84 is bulky—more than 900 pages—but weirdly light on its feet, like an astronaut in a spacesuit bouncing on the surface of the moon. Or perhaps that should be a moon, because the world in which this novel’s baffled characters find themselves seems to have two of them: the old, familiar one of love-song fame, and a smaller, dimmer one tagging along in its orbit. The heroine, a 29-year-old physical therapist and part-time hit woman named Aomame, tumbles into this strange bilunar reality by descending an emergency stairway from a gridlocked Tokyo expressway. The hero, Tengo, a math teacher and fiction writer (everyone in this book is, like the moon, somehow doubled), enters the same, skewed world by literary means. After rewriting a slim, apparently fantastic novel titled Air Chrysalis, by a mysterious teenage girl, he begins to notice that certain features of his normally unexciting everyday landscape seem to be changing, as if they were being repositioned to the coordinates of Air Chrysalis’s imaginary universe. The extra moon, which can’t be blinked away, is just the first of many signs. Aomome calls her new, through-the-looking-glass existence 1Q84, the Q (for “question”) pressed into service as a replacement for the mundane 9 of the year in which she’d thought she had been living. Tengo, a ruminative sort, theorizes and speculates, wondering at times whether his writing is in some way responsible for all these disturbing alterations of reality, and gets nowhere, like a man spinning a globe repeatedly, putting his finger there and there and there without ever quite knowing what he’s looking for, or even where he is. This world, he decides, is a place where “things had to be connected through hints and riddles, ellipses and variations.” He and Aomame, marooned and prey to forces they only dimly comprehend, are understandably uneasy there. But Murakami is right at home. He planted his flag in this elliptical, variable terrain a long time ago. That’s why 1Q84, despite its ambition and its daunting size, feels like a small step for Murakami, not a giant leap. The novel, which was published in Japan in three unimposing volumes, has a surprisingly—and winningly—casual air, as if spinning a tale at this extraordinary length were as natural as a walk around the neighborhood. 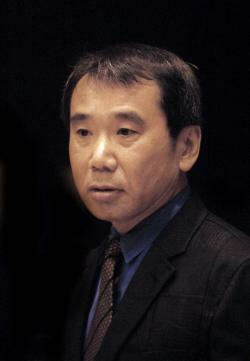 Just as he does in his shorter books, Murakami takes in wonders at a stroll. In the first half of 1Q84, while Murakami is setting this disorienting, just-off-true fictional universe in motion, the novel is intensely pleasurable. Tengo and Aomame are unaware of one another, but the reader, picking up on the small clues scattered strategically in the text, begins to sense their connection, to feel the inevitability of some sort of convergence. Although the plotting is furious, intricate, and inescapable, its importance somehow recedes as the story progresses. The danger of any big novel is that the narrative machinery can get cumbersome, inefficient: In the long course of the telling, it starts to clank and grind and sputter, and finally, overburdened, breaks down completely. In the second and, I think, more daring half of 1Q84, Murakami allows his enormous machine to wear out naturally. By the end, we’ve stopped expecting it to produce answers to the riddles of the universe; its labored operation just sounds like so much background noise. All that matters, really, in 1Q84 is the unearthly love story of Aomame and Tengo, who are a pretty typical Murakami couple. She’s determined, taciturn, and fierce-spirited; he’s rather passive and, it seems, permanently puzzled. The book’s epigraph is a lyric from the old standard “It’s Only a Paper Moon”—the part about “it wouldn’t be make believe if you believed in me”—and Murakami isn’t using it ironically. The sweet, corny sentiment expressed in those lines is a perfectly accurate statement of his theme. At its heart, the whole wild story is a berserkly elaborate boy-meets-girl romance, with metaphysical vaudeville to keep us entertained while we wait for the inevitable. In the book’s final chapters, the action slows noticeably as the hero and heroine, on the verge of meeting at last, try to sort out what’s been happening to them. They wonder, as lovers will, whether destiny is bringing them together or if they’ve simply dreamed each other into existence. Before the happy ending, if there’s to be one, they have to decide whose story they’re in. Late in the game, Aomame thinks, defiantly: “I am not just some passive being mixed up in this because someone else willed it. That might be partly true. But at the same time I chose to be here. I chose to be here of my own free will.” This interior monologue, from a character who is not at all prone to introspection, turns out to be the most momentous passage in 1Q84, the turning point at which the machinations of plot, and fate itself, become irrelevant, marginalized by the simple clarity of a character’s choice. 1Q84 doesn’t seem to have much in common with its near-namesake, George Orwell’s dystopian satire 1984, but it’s closer than it first appears—another moon in the same sky. Murakami’s imagined world is, like Orwell’s, an alternative reality created by language, and a reality that, by compelling surrender to an overpowering system of belief, threatens to obliterate the individual’s sense of self. In 1984, of course, the system wins; in 1Q84, it doesn’t. Finally, the world of the two moons and the creepy cult and the Little People just seems to drift away into some sort of cosmic ether, omnipresent but fundamentally useless: a great vacuum. Murakami’s massive novel is easy to read, but its strategy is so peculiar that some readers (and, on the evidence of the reviews, many critics) may find it difficult to grasp. 1Q84 brings a world into being for the sole purpose of destroying it: The book is, in a sense, a philosophical disaster epic. It creates, as good novels do, an impressive apparatus of belief and then gradually, deliberately undermines our faith and tells us, instead, that the only reality worth believing in is another person. This isn’t a big novel, and was never meant to be. The small, lovely thing it actually is emerges only at the end, like a butterfly from a cocoon: buoyant in the wind, almost weightless, unburdened by fate or fiction.